They're easy. They're silly. They're healthy. They're clever. They're artistic. They're delicious. They're fun. They're a great way to start the day. 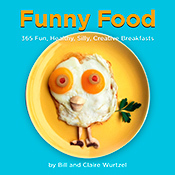 One breakfast at a time, Bill Wurtzel is determined to make you laugh and eat and play and laugh some more. Not since Joost Elffers' Play With Your Food has food been so ridiculous and so endlessly diverting. Parents and children will giggle through breakfast. Teachers and students can laugh some more making snacks or desserts after lunch. This is a book filled with nothing but engaging spontaneity and simplicity that makes you say, "I can do that." Really, who doesn't like to play with food? Bill Wurtzel, a jazz guitarist, has been making these plates for his wife, Claire, for as many years as they've been married. Now he is turning a hobby into an art form with a social message. His goal is to discourage obesity by inspiring children — and adults — to improve their eating habits by creating meals that are not only nutritious, but also fun.